And they returned from searching of the land after forty days. And they went and came to Moses, and to Aaron, and to all the congregation of the children of Israel, unto the wilderness of Paran, to Kadesh; and brought back word unto them, and unto all the congregation, and shewed them the fruit of the land. And they told him, and said, We came unto the land whither thou sentest us, and surely it floweth with milk and honey; and this is the fruit of it. Nevertheless the people be strong that dwell in the land, and the cities are walled, and very great: and moreover we saw the children of Anak there (Numbers 13:25-28). 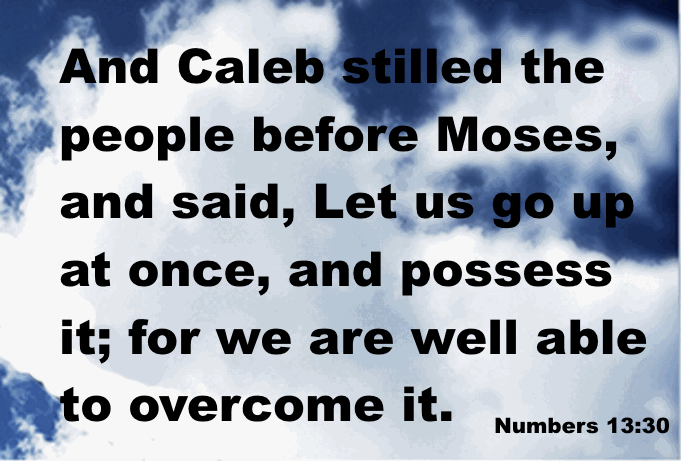 And Caleb stilled the people before Moses, and said, Let us go up at once, and possess it; for we are well able to overcome it (Numbers 13:30). But by that time, the evil report that the ten gave, had affected the children of Israel (600,000 men - Exodus 12:37-38 - and then adding women and children we can readily have had a total of a few million people). Caleb (and Joshua - Numbers 14:6-8) could not turn the tide, resulting in the children of Israel being lost in the wilderness for forty years. Anybody that was over twenty, at the time of the event, died in the wilderness (Numbers 14:29-35). The ten that carried the evil report died almost immediately in a plague (Numbers 14:36-37). Today evil reports in a church setting can bring about spiritual death of many saints. They walk away from the truth and never come back. Let us be careful not to speak evil and not to listen to evil as it will affect us. As the Lord commanded Moses, so the children of Israel did, and they divided the land. Then the children of Judah came unto Joshua in Gilgal: and Caleb the son of Jephunneh the Kenezite said unto him, Thou knowest the thing that the Lord said unto Moses the man of God concerning me and thee in Kadeshbarnea. Forty years old was I when Moses the servant of the Lord sent me from Kadeshbarnea to espy out the land; and I brought him word again as it was in mine heart. Nevertheless my brethren that went up with me made the heart of the people melt: but I wholly followed the Lord my God. And Moses sware on that day, saying, Surely the land whereon thy feet have trodden shall be thine inheritance, and thy children's for ever, because thou hast wholly followed the Lord my God. And now, behold, the Lord hath kept me alive, as he said, these forty and five years, even since the Lord spake this word unto Moses, while the children of Israel wandered in the wilderness: and now, lo, I am this day fourscore and five years old. As yet I am as strong this day as I was in the day that Moses sent me: as my strength was then, even so is my strength now, for war, both to go out, and to come in (Joshua 14:6-11). Now therefore give me this mountain, whereof the Lord spake in that day; for thou heardest in that day how the Anakims were there, and that the cities were great and fenced: if so be the Lord will be with me, then I shall be able to drive them out, as the Lord said. 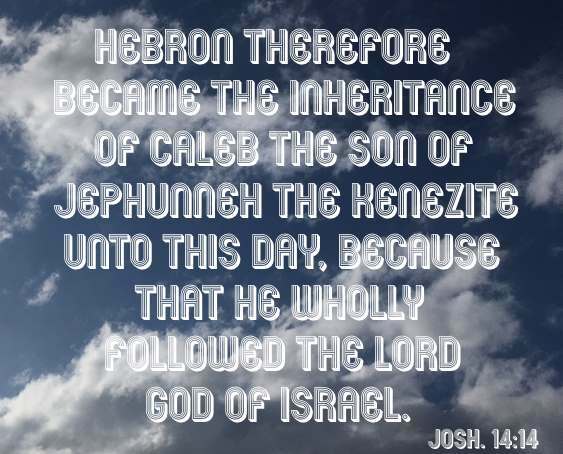 And Joshua blessed him, and gave unto Caleb the son of Jephunneh Hebron for an inheritance. 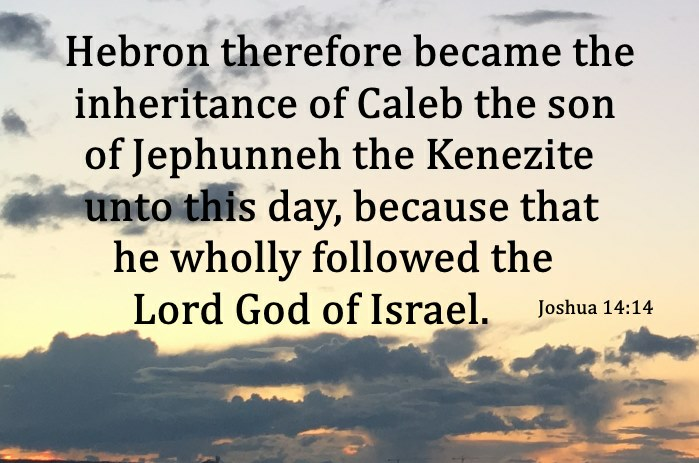 Hebron therefore became the inheritance of Caleb the son of Jephunneh the Kenezite unto this day, because that he wholly followed the Lord God of Israel. And the name of Hebron before was Kirjatharba; which Arba was a great man among the Anakims. And the land had rest from war (Joshua 14:12-15). Moreover whom he did predestinate, them he also called: and whom he called, them he also justified: and whom he justified, them he also glorified. What shall we then say to these things? If God be for us, who can be against us? He that spared not his own Son, but delivered him up for us all, how shall he not with him also freely give us all things? Who shall lay any thing to the charge of God's elect? It is God that justifieth. Who is he that condemneth? It is Christ that died, yea rather, that is risen again, who is even at the right hand of God, who also maketh intercession for us. Who shall separate us from the love of Christ? shall tribulation, or distress, or persecution, or famine, or nakedness, or peril, or sword? As it is written, For thy sake we are killed all the day long; we are accounted as sheep for the slaughter. Nay, in all these things we are more than conquerors through him that loved us. For I am persuaded, that neither death, nor life, nor angels, nor principalities, nor powers, nor things present, nor things to come, Nor height, nor depth, nor any other creature, shall be able to separate us from the love of God, which is in Christ Jesus our Lord (Romans 8:30-39). There is not anything that we will face in life that Jesus Christ, our Saviour and the One and only God, can't get us through. Hallelujah!